Project templates for different languages have the same name and cannot distinguish. Also, by the way, why isn’t auto-completing brackets and parentheses possible? yeah, we’re working on that. 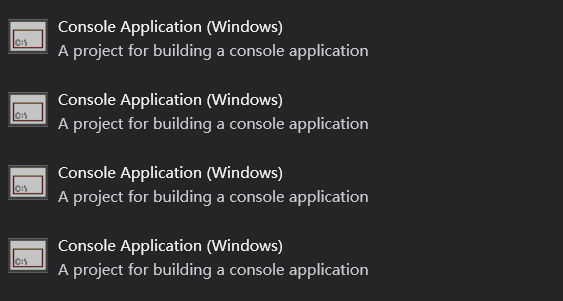 unfortunately VS2019 (which is still Experimental) made a total mess of the New Project dialog, including dropping our ability to register/show templates properly :(. I’m sorry, I had missed this part originally. Can you elaborate? The auto-complete system is kind of forcing. I suggest to apply the auto-complete only when “Enter” pressed instead of pressing any key. It looks like Code Completion is showing bad data (but its hard to say coz the gif plays too quickly), thats why this happens. CC should normally only ever auto-complete when in cases where all valid elements are on the list (such as here). There also seems to be an NRE happening in CC after =, which is probably part of/contributes to the problem. Can you send me the project that shows this? Just a new Island Swift project with this single file. The parenthesis problem he’s talking about is probably that the “auto-complete brackets” option of the RemObjects editors in VS settings are disabled and cannot be checked. Also, in VC# editors, when we type a “(“, the editor would automatically append a “)” and set the cursor between the “(“ and “)”, but this is not available in Water and Elements VS Plugin. An empty Island project would not have .NET namespaces in the uses clause though. (which might be part of the problem. Can you send me the exact project where you see this CC behavior, please? Reproduced, thanx. Logged as 82408.